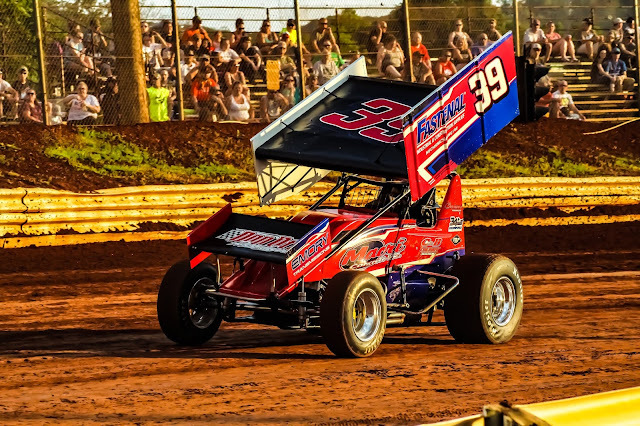 ABBOTTSTOWN, PA 7/14/2018 – Danny Dietrich took no prisoners in the first of two 410 sprint features at Lincoln Speedway Saturday night. Dietrich charged from his 11th starting spot in the June 23rd Fallen Firefighters Memorial make-up race to catch and pass Brian Montieth in lapped traffic on the 21st lap and hold on the rest of the way to win his third 410 Sprint feature in-a-row in a non-stop 33-lap time of 8 minutes, 49.443 seconds. A pair of No.21 cars controlled the top-spot for the first 20-laps of the rescheduled June 23rd Fallen Firefighters Memorial feature. First, polesitter Scott Fisher in the No.21T, grabbed the lead at the drop of the green and desperately tried to hold on to the top spot through the non-stop lapped traffic. Enter the No.21 of six-time track champ Brian Montieth. Montieth came charging to the front from his seventh starting spot to take the lead from Fisher on the 19th lap. Then all eyes looked behind Montieth. Dietrich was keeping pace with Montieth as he drove through the lapped traffic and was able to get by Fisher as well on the 19th lap to move into second. And the chase was on. Dietrich and Montieth began to frantically weave in-and-out of the lapped cars over the next few laps. Dietrich got by Montieth on the 21st lap for the lead and was able keep it the rest of the way to take the checkered for his 5th win of the year at Lincoln. It took Dietrich just under nine minutes of non-stop racing to pick up his 42nd career Lincoln win and pass Cris Eash to claim sole possession of seventh place on the all-time win list. Montieth settled for second, with outside front row starter Anthony Macri finishing third, 13th starting Matt Campbell fourth, and Austin Hogue fifth. Completing the top-10 were Chad Trout, 14th starting Freddie Rahmer, Lucas Wolfe, 15th starting Jim Siegel, and 20th starting Brandon Rahmer. Of the original 24-starters from the June 23rd event, Greg Hodnett, Brock Zearfoss and Cole Young were not in attendance. They were replaced by alternates for the make-up feature. Anthony Macri backed up his strong third place in the make-up feature earlier in the evening by getting by polesitter and race-long leader Brett Michalski on a 14th lap restart to take the lead on the 14th lap. The restart leading to the pass for the lead was set up by a wild crash on the 14th lap that saw Australian racer Jessie Attard, Brandon Rahmer, Freddie Rahmer, and Jim Siegel all crash while running 3rd, 4th, 5th, and 7th respectively. This put Macri on race-leader Michalski’s bumper on the restart. Macri wasted no time and got by Michalski for the lead on the 14th lap restart. The remainder of the 25-lap feature excitement behind the leader as both Montieth and Dietrich were trying desperately to get to the front after failing to qualify in there heat races and were forced to start 22nd and 23rd respectively. First, Dietrich hit the first and second turn wall and flipped on the 15th lap bringing out the red. Somehow he was able to make repairs and rejoined the field at the rear for the restart. Then second place Michalski crashed on the subsequent restart, putting Tyler Ross and Chad Trout in second and third place for the restart. Then the final stoppage of action came on the 16th lap as Dietrich and Montieth got tangled up entering the third and fourth turns, with Dietrich flipping again. This time Dietrich suffered severe damage, as did Montieth, ending both racers night. The final nine laps saw Ross, Trout, and Lucas Wolfe try to catch the race-leading Macri to no avail. Macri picked up his second career win after 25 laps with Ross, Trout, Lucas Wolfe, and 16th-starting Adam Wilt finish second through fifth respectively. Completing the top-10 were 15th-starting Kyle Moody, 20th-starting Gerard McIntyre, Jr., 24th-starting Alan Krimes, 14th-starting Glenndon Forsythe, and 21st-starting Cory Haas. All told, only 14 cars out of the 24 original starters completed the event. Heats for the 34 410 Sprints were won by Myers, Brandon Rahmer, Attard, Scott Fisher, with Cory Haas winning the consolation. Matt Findley started on the pole and led all 20-laps en route to his first career win in the 358 Sprint feature. Jeff Halligan, Cody Hartlaub, Dave Brown, Cody Fletcher, and Tyler Ross all chased Findley in that order through the entire second half of the race to no avail. At the end of 20 laps Findley picked up his inaugural win over Halligan, Hartlaub, Brown, and Fletcher. Completing the top-10 were Ross, Wyatt Hinkle, Tyler Walton, Kyle Denmyer, and Scott Geesey. Heats for the 26 358 Sprints were won by Geesey, Hartlaub, and Hinkle, with Eric Parker winning the consolation. Jeremy Ott passed polesitter and race-long leader Lucas Montgomery on the fifth lap and led the rest of the way to pick up the win in the 20-lap Central PA Legends feature. Montgomery ran second the rest of the way with Bill Diehl, Scott Smith, and Trent Yoder finishing third through fifth. Completing the top-10 were Travis Perry, Mason Chaney, Alex Robinson, Donnie Leiby, and Zachary Settle. Heats for the 28 Central PA Legends were won by Perry, Diehl, and Smith, with Brian Racine winning the consolation. 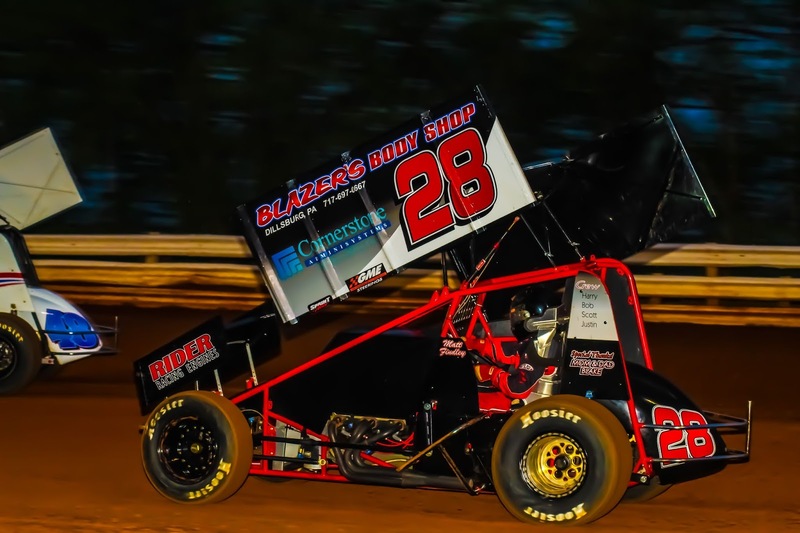 Lincoln Speedway swings back into action this Thursday night, July 19th, as the World of Outlaws return to take on the Pennsylvania Posse at the Pigeon Hills oval to make-up the rained-out show from May 16th. The 410 Sprint only show will get underway at 7:30 PM, with gates opening at 4 PM. Then next Saturday night, July 21st, Lincoln Speedway will be dark to allow the racers to attend special shows elsewhere. Lincoln will get back to racing on Saturday night July 28th, at 7:30 PM with PEPSI NIGHT/ARCH NIGHT featuring the 410 Sprints, 358 Sprints, and Mid-Atlantic Modifieds. 410 Sprint Heat Four Finish (10 laps/5 to qualify) – 1. 21T-Scott Fisher; 2. 39M-Anthony Macri; 3. 59-Jim Siegel; 4. 15-Adam Wilt; 5. 07-Gerard McIntyre, Jr.; 6. 74-Dwayne Gutshall; 7. 6K-Chris Knopp; DNS – 48-Danny Dietrich. 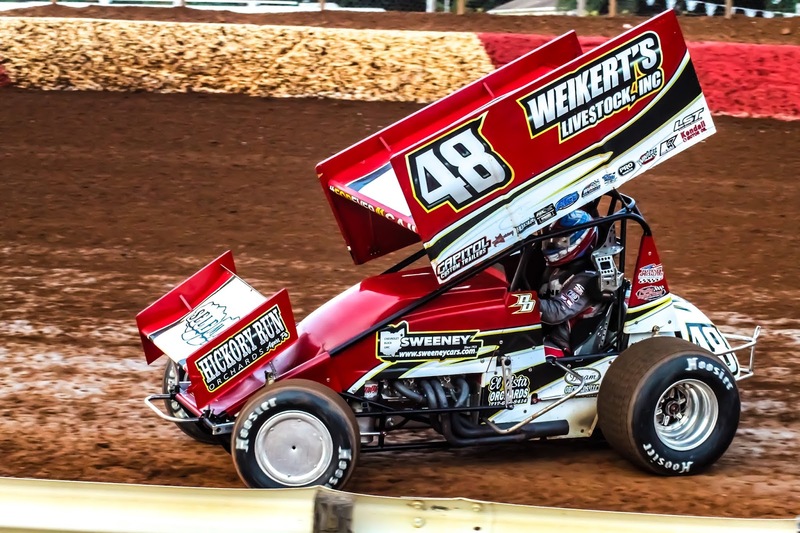 410 Sprint Consi Finish (10 laps/6 to qualify) – 1. Cory Haas; 2. 21-Brian Montieth; 3. 48-Danny Dietrich; 4. 87-Alan Krimes; 5. 7K-Dan Shetler; 6. 86-Steve Storrie; 7. 35-Tyler Esh; 8. 3B-Randy Baughman; 9. 6K-Chris Knopp; 10. 74-Dwayne Gutshall; 11. 11-Greg Plank; 12. 10-Zach Eucalano. 358 Sprint Consi Finish (10 laps/6 to qualify) – 1. 28P-Eric Parker; 2. 19-Troy Wagaman, Jr.; 3. 54-Brett Wanner; 4. 5A-Zachary Allman; 5. 2-Denny Gross; 6. 50-Alyson Dietz; 7. 34-Mark Van Horst. Legends Heat Three Finish (8 laps/6 to qualify) – 1. Scott Smith; 2. 00-Lucas Montgomery; 3. 95-Alex Schmeidel; 4. 7MD-Nate Renfro; 5. 93-Brent Marquis; 6. 9-Rick Hartwig; 7. 34-Dan Harrison; 8. 99S-Jeff Shellenberger; DNS – 3M-Chris McKinney. Legends Consi Finish (8 laps/6 to qualify) – 1. 14-Brian Racine; 2. 3M-Chris McKinney; 3. 75-Chandler Pagnotta; 4. 34-Dan Harrison; 5. 99S-Jeff Shellenberger; 6. 91-Ben Goldsmith; 7. 83J-James Snow; 8. 85-Michael Goldsmith; 9. 43-Brandon Reiblich.